The technology behind Bitcoin and alternative currencies doesn’t often conjure up visions of glamor and divas. However, blockchain does have its share of drama. On a high note, the film and music industries have discovered blockchain, a decentralized technology behind Bitcoin that will soon debut in Hollywood. There are several ways in which blockchain technology can and probably will disrupt the way we access, track, and consume film, music, and streaming media. Some involve tokens that can better manage spending, with one in particular creating an entirely new asset class for investors. The bulk of developing projects, however, implement the use of smart contracts and decentralized ledgers. A forensic investigation by the Department of Arts and Culture into claims of mismanagement and abuse of funds recently implicated “some of the executive and senior management” of the National Film and Video Foundation (NFVF). The cancellation of Sydney’s Tropfest, the world’s largest short film festival, after 23 years was due to allegations of financial mismanagement. Many of such revenue-sharing operations would greatly benefit from the use of smart contracts and tokens. It’s no secret that transparency is something Hollywood and the entertainment industry has lacked since inception. Exacerbating this are strangling unions and inflexible executives unable and unwilling to implement new technology. Smart contracts would allow execution of automatic transactions on the basis of preset conditions. Implementation of tokens could be in many ways. However, the two methods under exploration are those for exchange in a secondary market and others for distribution as shares. Christopher Woodrow, an American financier and CEO/Founder of MovieCoin proposes both utility and security tokens. Utility tokens would address the business side of filmmaking that would track, verify, and distribute payments to screenwriters, musicians, cast, crew, etc. Offer of a security token would only be to accredited investors. The first blockchain experiment in film is a romantic comedy by the name of No Postage Necessary. Current distribution is through a P2P incentivized video network utilizing the blockchain app Qtum. Following its release in theaters, it will also be available to online viewers for purchase with Bitcoin. While this may not be the end-all in film distribution, it does break ground for an industry desperate to eliminate a litany of movie-making middle men gouging investment and box office revenues. In its last public filing, AFM’s (American Federation of Musicians) Intellectual Property Rights Distribution fund misappropriated or withheld more than $25 million in royalties due to musicians and background singers. A related AFM fund, The Film Musicians Secondary Market Fund, along with the Alliance of Motion Picture and Television Producers (AMPTP), is sitting on an estimated $5 million in unpaid funds. Famous musicians waiting on these delinquent royalties include big names like Mick Jagger, Keith Richards, Elton John, Aretha Franklin, Paul Simon, James Taylor, Axl Rose, Tony Bennett, and Cyndi Lauper. Then there is the issue of streaming services that often collect the lion’s share of profits, leaving little to the artists. OPUS, a startup powered by the Ethereum blockchain, is positioning itself as the world’s first decentralized music platform. OPUS aims to address long-standing issues in the entertainment and streaming industry, including how multimedia content is distributed and consumed online while ensuring artists receive maximum earnings. By leveraging Ethereum, the platform can deliver thousands of tracks per second in a fully-decentralized manner. It also tracks and stores files permanently through the IPFS swarm to ensure transparency. Smart contracts would allow end-users to directly compensate creators for their music. Early Digital platforms like Napster and Limewire paved the way for streaming media, but were rife with piracy due to lack of security and there was virtually no accountability. While Netflix resolved those issues, the rates of those who use it often are subsidized by those who do not. Bitcoin uses blockchain’s immutable ledger to enable transactions that don’t require third-party oversight. Streaming content providers could use blockchain to exchange content directly with paying consumers. Cutting out the middleman would not only generate more profit, but decrease costs. Token holders would use their tokens to access content. The token’s immutable ledger and smart contracts would automatically provide the purchaser with the content and the provider with payment. The transaction ledger would also guard against piracy, as access credentials on the blockchain can’t be duplicated. This arrangement helps small creators as much as it does large ones looking for better distribution models. Many cloud-based services like Spotify, Amazon Music, and iTunes have limited licenses that restrict access to residents of other countries. The blockchain and its decentralized and distributed ledger could resolve this. DECENT, a recently-launched platform, benefits publishers by allowing them to offer content globally to consumers. Direct P2P sales and purchases would eliminate the need for licenses issued by middlemen who unilaterally block access to content. Blockchain, ICOs, and smart contracts are not for Los Angeles, nor are they being produced in California’s famous tech sector. International developers are currently collaborating with highly acclaimed players from the world of crypto, blockchain, finance, media, and entertainment. All are competing to produce innovative platforms and applications with the goal of benefiting artists, industries, and consumers. Have you joined our PURA Telegram Group yet? We have a surprise for you! 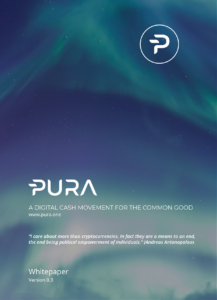 PURA is a cryptocurrency that directly funds fully transparent, blockchain-tracked, sustainable environmental and social projects around the globe, removing the need to simply trust a non-profit or pro-social cause based on good faith alone. PURA Crypto News – What is A DAO? PURA Cryptocurrency News – Could Blockchain Spell the End of Fake News? PURA Crypto News – Buy with cryptocurrencies!